Carla Rosso was in her backyard and had gone to retrieve her dog Duchess’ rope toy when she received the surprise of her life – the “rope toy” was a baby rattlesnake! 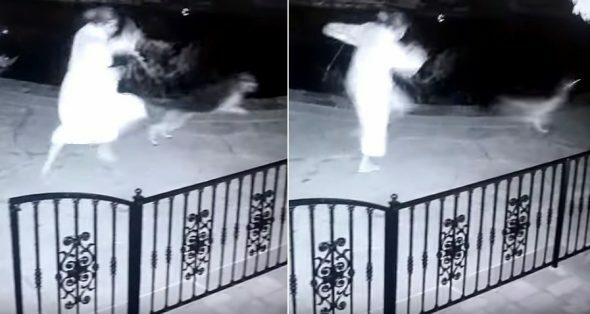 Carla and her husband Ariel have surveillance cameras set up outside of their California home and managed to capture the event on video. The couple had just gotten out of their hot tub when Carla went to get the toy for Duchess. The second she realized what she had touched, she did a horrified skedaddle back from whence she came. Los Angeles County firefighters came to the house to kill the snake. They explained that baby rattlesnakes can sometimes be more dangerous than adults, as they are not yet in complete control of how much venom they release. Additionally, baby rattler venom contains neurotoxins which can be slightly more toxic than the cytotoxins which make up most of the venom in adult rattlesnakes.